Salted Caramel Ice Cream is just our flavor. Well, that is exactly why we’re still singing the ice cream song. Although this time we’re singing it right in our own kitchen, armed with spoons and bowls to scoop this tasty Salted Caramel Ice Cream right up into. You’re not alone. We like to indulge in a sweet dessert from time to time around here as well. You can find us nibbling on Hazelnut Cheesecake Icebox Cake, Twix Brownie Trifles, and other fun desserts like Peanut Butter Ice Cream Pie. Yep. We’re down with all of those desserts because they all have amazing flavor. All you have to do is follow the simple recipe instructions to make this delicious ice cream dessert. We’re pretty sure it will quickly become a family favorite. Combine the coconut milk, sea salt, and sugar in a blender and mix for a minute until completely smooth. Add the salted caramel and vanilla bean paste. Mix for 1 more minute. 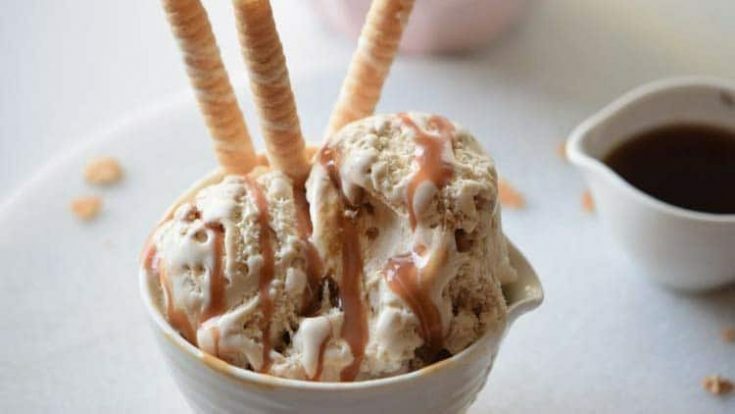 Add some caramel sauce to the mixture while churning, to add more caramel flavor to the ice cream. Pour the mix into the ice cream maker and follow the maker’s instructions to churn the ice cream.